Warren Buffett’s 7 rules of investing from the 1983 letter to shareholders. Good day for investors. I continue with my summaries of Warren Buffett's letter to shareholders 1983. He summarizes his investment business rules the key business rules and I have summarized seven of them for you which were great for having the best investment mindset. 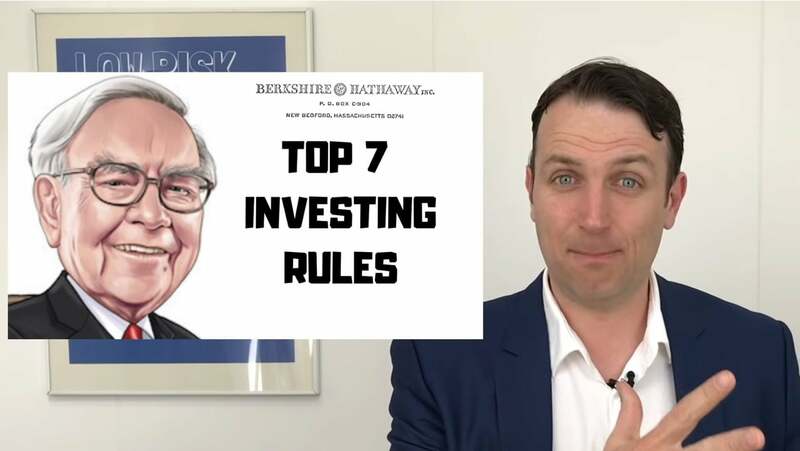 So here we go with Buffett 7 business investing rules. Number one make sure the management is focused on improving shareholder value not of their own value. So stock market compensation option compensation schemes buybacksetc. usually improves management value as Buffett would say we do not view the company itself as the ultimate owner of the business assets but instead view the company as a conduit through which our shareholders own the assets. Number two investment managers have to eat their own cooking. So as he says most managers have more of 50 percent of family net worth in Berkshire. So they eat their own cooking. If you invest when somebody always be sure make sure that they invest alongside with you and that they eat their own cooking. If not please you will be screwed. So if your banker doesn't have his wealth in the same assets he's trying to sell you. Runaway number free diversify but do it over time. Our preference would be to reach this goal is higher than the average American return on business investment go directly owning a diversified group of businesses that generate cash and consistently earn above average returns on capital. So in the 1970s Buffett was building the insurance part of the business. Now in 1982 1983 he added heavily to cigarettes and food because he found those to be the best investments and if we look at his portfolio of course Geico is still the highest position but at very low cost almost a 10 bagger. The second position is General Foods and the first most money invested position isR.J. Reynolds the cigarette company. So he diversified over time and he buys what is cheap when that is cheap for long term investments on death. The rule is long term fixed rates. We rarely use much debt and when we do we attempt to structure it on a long term fixed rate basis. Why is the fixed rate base is so important because it gives you one less thing to think about if you have to think about. Where will interest rates go. The year of inflation a year of higher interest rates might make you do the wrong decision. If you have that fixed that's one thing to think less limits your risk and you can manage other fixed things of your portfolio if your investment perform your wealth differently. Number five measure performance long term five to 10 years as he says we will continue to apply it on a five year rolling basis. Even better if you measure it in a psycho basis so from top diptych Syco to the next up cycle. Who did the best. Which changes things which requires patience but is very important from a business perspective. Don't ever issue equity. He says that they issued some stock and they will issue. However he was young and foolish in the 1970s 80s 1990s with Dexter Shoes and I think it is something he regrets so also from my business perspective never never issue equity. If you really must not do so or it's a really big advantage to you number seven a very very interesting decision. Never sell a good business you should be fully aware of one attitude. Charlie and I share that hurts our financial performance regardless of price. We have no interest at all in selling any good businesses that Berkshire owns. And this is because when you own a good business the long term returns that that good business will offer are limited. No matter the current price and the market and nobody can price that in. So a business that will grow with 10 percent over the next 20 years 30 years devalue of that business is infinity and that's something Buffett understood back then he kept his businesses as long as he could. We have seen the Washington Post he held it for 40 years and only then sold it to bezels so simple good businesses will deliver forever higher earnings higher dividends higher returns on invested capital no current price can justify selling that. Thank you for watching. Enjoyed the seven short simple rules which are also the mindset of this investing channel where we do stock analysis and we focus on having a good rational investment value investing mindset please subscribe.